Cumberland County is a county located in the U.S. state of Kentucky. As of the 2010 census, the population was 6,856. 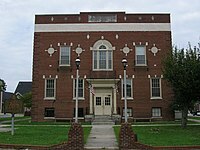 Its county seat is Burkesville. The county was formed in 1798 and named for the Cumberland River, which in turn may have been named after the Duke of Cumberland or the English county of Cumberland. Cumberland County was a dry county however now is a wet county as of June 28, 2016, which means that the sale of alcohol is now legal. Cumberland County was created in 1798 from land given by Green County. In 1829, the first oil well in the United States was dug three miles north of Burkesville. However, it is usually not recognized as such because the drillers were looking for salt brine. It was the first county in the United States to elect a female sheriff, Pearl Carter Pace. Burkesville is the first city downstream from Wolf Creek Dam. There has been much recent concern about the dam's stability. According to the U.S. Census Bureau, the county has a total area of 311 square miles (810 km2), of which 305 square miles (790 km2) is land and 5.7 square miles (15 km2) (1.8%) is water. Major waterways include the Cumberland River and a small branch of Dale Hollow Lake which covers the southern end of the county. As of the census of 2000, there were 7,147 people, 2,976 households, and 2,038 families residing in the county. The population density was 23 per square mile (8.9 /km2). There were 3,567 housing units at an average density of 12 per square mile (4.6 /km2). The racial makeup of the county was 95.28% White, 3.41% Black or African American, 0.14% Native American, 0.04% Asian, 0.06% Pacific Islander, 0.15% from other races, and 0.91% from two or more races. 0.60% of the population were Hispanic or Latino of any race. There were 2,976 households out of which 29.40% had children under the age of 18 living with them, 53.00% were married couples living together, 11.20% had a female householder with no husband present, and 31.50% were non-families. 28.90% of all households were made up of individuals and 14.50% had someone living alone who was 65 years of age or older. The average household size was 2.37 and the average family size was 2.89. In the county, the population was spread out with 23.60% under the age of 18, 6.90% from 18 to 24, 26.80% from 25 to 44, 24.80% from 45 to 64, and 17.90% who were 65 years of age or older. The median age was 40 years. For every 100 females there were 92.70 males. For every 100 females age 18 and over, there were 89.10 males. The median income for a household in the county was $21,572, and the median income for a family was $28,701. Males had a median income of $21,313 versus $16,548 for females. The per capita income for the county was $12,643. About 16.40% of families and 23.80% of the population were below the poverty line, including 30.30% of those under age 18 and 33.00% of those age 65 or over. As of 2012, Cumberland County has the fewest number of registered Democrats, 844, out of all of Kentucky's counties. Cumberland County was the birthplace of Joel Cheek who later made Maxwell House coffee. ^ a b "State & County QuickFacts". United States Census Bureau. http://quickfacts.census.gov/qfd/states/21/21057.html. Retrieved March 6, 2014. ^ Gannett, Henry (1905). The Origin of Certain Place Names in the United States. Govt. Print. Off.. pp. 97. https://books.google.com/books?id=9V1IAAAAMAAJ&pg=PA97#v=onepage&q&f=false. ^ "Montana Governor Edwin Lee Norris". National Governors Association. http://www.nga.org/cms/home/governors/past-governors-bios/page_montana/col2-content/main-content-list/title_norris_edwin.html. Retrieved October 10, 2012. ^ Applegate, Kris; Miller, Jarenda (2009). Around Lake Cumberland. Arcadia Publishing. p. 35. ISBN 978-0-7385-6819-5. https://books.google.com/books?id=bDxc37SOugoC&pg=PA35. This page uses content from the English language Wikipedia. The original content was at Cumberland County, Kentucky. The list of authors can be seen in the page history. As with this Familypedia wiki, the content of Wikipedia is available under the Creative Commons License.